If you ever tried to find spaghetti squash in the UK, you know it&apos;s almost an impossible task. I always envied my American friends who were enjoying this fantastic low-carb vegetable served with keto meals all year round. Last year I decided to grow my own. And I failed... twice. In both cases the plant was destroyed by vine borer before any squash could grow. My lack of gardening skills and the notoriously wet English weather didn&apos;t help either. In the end I only managed to save two tiny fruits which was enough to try spaghetti squash for the first time. My first attempt at cooking it wasn&apos;t very successful and it ended up being too watery and mushy. I needed to try a different cooking method. Luckily I found some more squashes in London and had enough to try different cooking methods. I&apos;ve seen tips for steaming, microwaving and even slow cooking in a crockpot but none of these worked for me. My preferred way to cook spaghetti squash is roasting it in the oven. This way you avoid any unwanted moisture and mushy strands. Don&apos;t have high expectations if you are looking for a perfect replacement for pasta. Spaghetti squash, which is technically a fruit, does not taste like pasta. It&apos;s sweeter than zucchini noodles and contains slightly more carbs but it&apos;s still suitable for the ketogenic diet. Preheat the oven to 200 °C/ 400 °F. 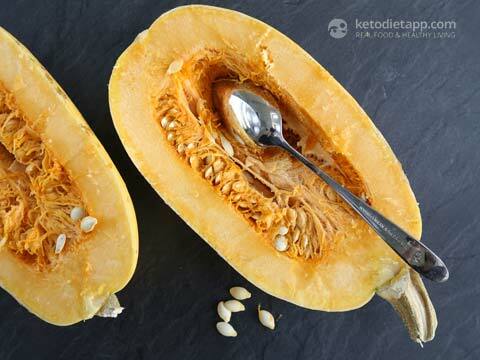 Cut the spaghetti squash in half, either lengthwise or widthwise (if you cut it widthwise, you&apos;ll get slightly longer strands once it&apos;s cooked). The skin of uncooked spaghetti squash is hard and it&apos;s difficult to cut through. Use the tip of a chef&apos;s knife to break through the skin in the middle part and push the blade down until cut through. Using a spoon, scoop out the seeds. Optionally, brush with ghee and season with salt. You can use any other fat or oil suitable for cooking (lard, duck fat, coconut oil or olive oil). Cover with a foil (it will prevent the squash from burning on top before it cooks through), place in the oven and cook for 30 minutes. This timing works for medium-large spaghetti squash. Small quash will only need 15-20 minutes. After 30 minutes, remove the foil and cook for another 10-20 minutes. When done, remove from the oven and let it cool down on a rack for 5-10 minutes. Using a fork, pull the strands out and place in a bowl. To serve, top with sauces such as Marinara, Keto Cheese Sauce, Pesto or Alfredo Sauce and serve with meatballs, meat skewers or simply topped with grated Parmesan cheese. 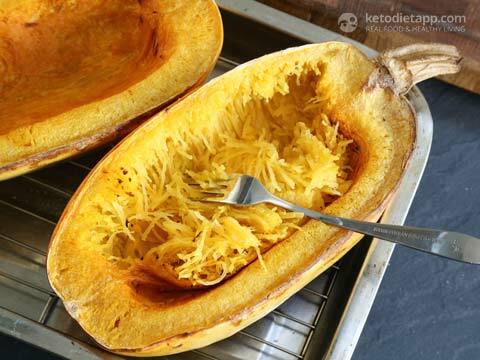 Cooked spaghetti squash can be stored in the fridge in an airtight container for up to 5 days. For longer storage, place in plastic bags divided in manageable portions, flatten and freeze flat for up to 6 months. 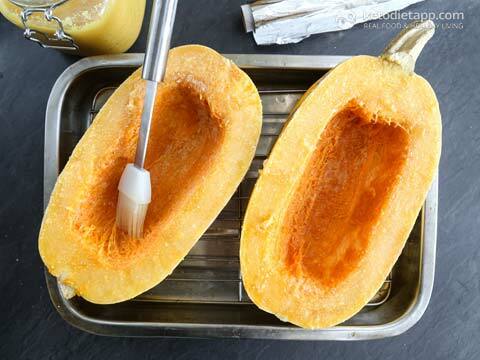 When ready to serve, let the prepared squash defrost at room temperature or in the fridge. 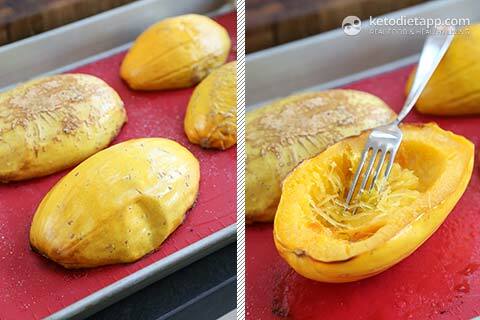 Alternative baking tip: You can bake the squash cut-side down for 40-50 minutes (25-30 minutes for small squash). When done, remove from the oven and let it cool down before turning cut-side up and pulling the strands out. This way the squash will steam without too much moisture left in the squash and without developing the caramelised top commonly seen when you bake it cut-side up. Either method works great so it&apos;s up to you which one you use. I just wanted to let you know that it's very easy to cook it whole in the oven as well, since the skin IS so hard. I put it in a glass baking dish, 400* F for an hour. Add about a 1/4 inch of water in the dish and cover loosely with aluminum foil. After an hour, see if a fork will poke through it fairly easily. That way the skin is super easy to cut! Cut in half (remember it'll be hot! and scoop out in strands as you said. Raw winter squash is very hard to cut. There is an easier way to cook winter squash. Poke the uncut squash with a fork. Put it on a baking sheet and bake at 400F for 45 -60 minutes. When you can easily slide a knife into it then it is done. Remove it from the oven and let it cool so you can handle it. Then cut it in half and scoop out the seeds. If I roast it cut side down to reduce the amount of moisture, do I still cover it with foil? Hi Connie, no, you won't need to cover it. 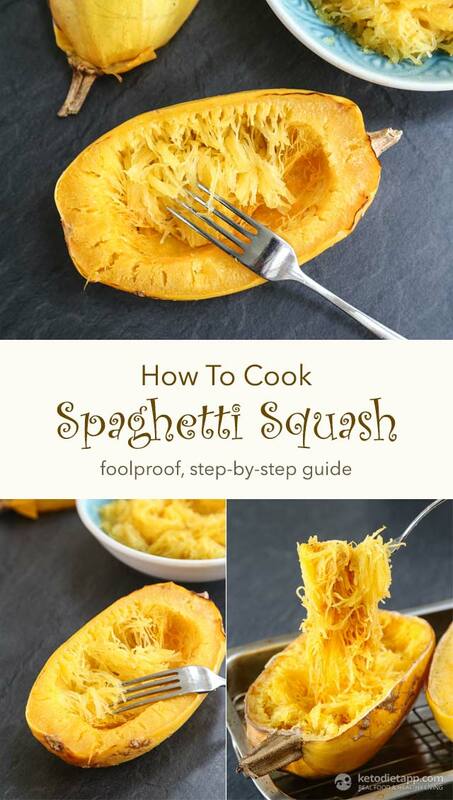 Have you ever cooked spaghetti squash? Well, that's what it takes. It can take 25-50 minutes, depending on the size. Of you can just steam/boil green beans, kale, etc. - that would take 5-8 minutes.